November 29, 2018 was blogger, entrepreneur, and democracy activist Tran Huynh Duy Thuc’s 10th birthday in prison. Read about his impact on the Vietnamese democratic movement, the current situation for activists, and Thuc's own fight for freedom using new provisions in the revised Criminal Code. Overall, his situation in prison has greatly worsened. At his most recent family visit, Thuc informed his family that he suffered health issues from a possible poisoning on November 20, and prison authorities were denying him water to boil noodles and the ability to receive letters; they were also considering denying him other items at the time of this writing, like a blood pressure monitor, with no legal basis. He asked the international community to intervene on his behalf. Tran Huynh Duy Thuc’s daughter wrote an open letter to the international community in light of a possible attempted poisoning against Thuc in prison on November 20 and overall worsened prison conditions. In the letter, she writes: "Our family is extremely worried about his health and safety since we believe these new forms of mistreatment are used to coerce my dad to admit guilty in exchange for an early parole. For the past 9 years, my dad steadfastly believes that fighting for freedom of speech is not a crime. My dad has never inflicted violence or threats against the government. He has announced for many times that he is innocent and will never admit guilty." On December 8, Tran Huynh Duy Thuc's family went to visit him in prison. Lawyer Ngo Ngoc Trai also accompanied them to meet Thuc and demanded that detention center officials investigate the alleged poisoning against Thuc. However, detention officials did not allow him to meet with Thuc; they themselves met with Trai separately. They informed Trai that they received his previous letter concerning the matter and passed it to superior authorities for further consultation. British Member of European Parliament Julie Ward sent a letter to Vietnam's President calling on the country to release Thuc from prison -- and without the condition of exile. Thuc was said to look healthy during the family's visit in spite of only eating instant noodles. 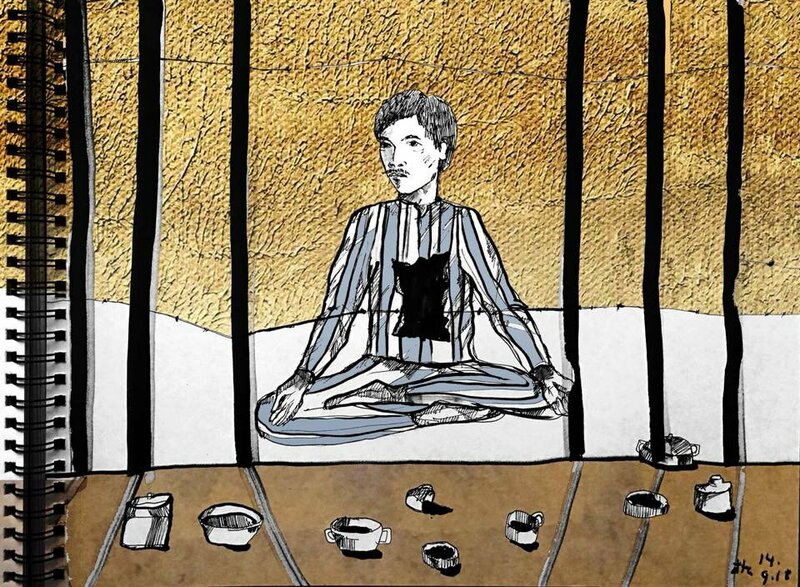 Prison authorities had begun to provide him boiled water again, but Thuc still refused to eat food provided by the prison, arguing that there is nothing to ensure his safety. He said to his family that he might be at risk of suffering from "incidents" in prison. Tran Huynh Duy Thuc is an engineer and entrepreneur from Ho Chi Minh City. He founded EIS, a successful Internet phone service company in Vietnam with two branches in Singapore and the U.S. It was the first Vietnamese company to invest in high technologies abroad. Thuc founded the Chan research group to study the economy, politics, and society of Vietnam and some other countries. He blogged about social, political, and economic issues in Vietnam under the pen name Tran Dong Chan. Thuc is married and has two children. Thuc’s family is very active in advocating for his release; his father participated in a mini-interview series with The 88 Project in the summer of 2013. They also maintain website about his case. Thuc’s family has maintained his innocence throughout his arrest, trial, and sentence. Followers of Thuc have started two petitions on change.org to "urge VietNam Communist Party as well as the Parliament to hold a referendum for free election and on transformation to a multi-party political regime with the attendance and monitoring of the civil society groups across the nation." Arrested May 24, 2009. Sentenced to 16 years in prison under Art. 79 (1999 Code). Expected Release is May 24, 2025. Thuc was arrested on May 24, 2009 and held in pre-trial detention, where he was possibly tortured in attempts to solicit a coerced confession. He was initially arrested for "theft of telephone wires," but later charged under Article 79 for subversion. He was tried on January 20, 2010, with three co-defendants (Nguyen Tien Trung, Le Cong Dinh, and Le Thang Long) in Ho Chi Minh City. He was sentenced to sixteen years in prison and five years of probation. His and his co-defendant's detentions were deemed arbitrary by the UN Working Group on Arbitrary Detention in 2012. He has been adopted by Rep. Zoe Lofgren (D-CA) as part of the Tom Lantos Human Rights Comission’s Defending Freedoms Project. Throughout his imprisonment, Thuc has endured harsh treatment. He has often been targeted for standing up for the rights of other prisoners and has had communication with family limited by the authorities. He has led hunger strikes while imprisoned, and, while he has been offered early release in exchange for leaving the country, refuses to be exiled from Vietnam. In May of 2016, he was transferred to a prison farther away from his family. The reason for the transfer was unclear, but his distancing strategy has been used on other prisoners of conscience, and could be related to his refusal to accept an early release in exchange for exile from Vietnam. Thuc annnounced he is appealing his sentence in light of changes to Vietnam's Criminal Code. Under his current sentence, he is due for release in May of 2025. Read our reflection on his case and his contributions to Vietnamese civil society, here. In a phone call to his family on June 30, Tran Huynh Duy Thuc told his wife that on June 25, a delegation of the European Union and German Embassy in Vietnam had visited him for an hour in Prison No. 6, Nghe An province. The delegation asked about Thuc's wishes, and he reiterated that he would not want to live abroad, and that he wanted to stay in Vietnam to serve his country. Thus, Thuc again ruled out the possibility of him accepting to be exiled in exchange for an early release. Thuc also said he wanted his case to be resolved according to the law and has continued to press for an appeal of his conviction. His health has been more stable recently. Thuc wrote a series of letters home to his family about prison life and his thoughts on the activist movement today in Vietnam. In the first of a series of translations, this letter details his visit from foreign officials on June 25. In the second letter, Thuc wrote about the need for open and innovative global economic systems, saying: "...in order to possess superior technologies, the nation must be a society in which ideas and activities flow freely to create a free competitive environment." In the third and last letter, also from June 2018, Thuc wrote: "Whether as a civilian or a prisoner, I always try my best to do everything I can to help the nation fulfills its historical mission. This has been my ultimate goal for many years." Tran Huynh Duy Thuc ended his hunger strike after 34 days. His family was allowed a brief visit with him on September 15, but was prohibited from "discussing outside news" with him. Thuc objected to this arbitrary prohibition and was taken away shortly after the visit started, and his family was also forced outside of the prison. They were allowed another brief visit with him on September 16, during which Thuc agreed with his family to end the hunger strike to maintain his health, but emphasized that he would continue to petition the authorities to respect the rule of law, not only in his own case, but also in others'. On September 8, Thuc's family had issued this letter requesting that the prison authorities inform the family about Thuc's current condition, as well as allow Thuc to make a phone call home. He had been protesting increased restrictions in prison, as well as his opposition to authorities’ attempts to get him to accept exile in exchange for early release. Tran Huynh Duy Thuc's family met him on October 12. He said that he had gained weight and his health is good. This meeting was more comfortable because police did not interrupt them when they talked about outside information, especially on EU-Vietnam Free Trade Agreement hearing that Dr. Nguyen Quang A had just attended in Belgium. One day after this meeting, Thuc made a 5-minute phone call to his family. This is abnormal because he is normally only allowed to call during the end of the month. He still wants Vietnam to sign the trade agreement with the EU to prove that respecting the law is Vietnam’s trademark. He said thanks to all who are concerned about him and to all those who have supported him, as well as called on people to continue supporting him and other political prisoners in their fight for freedom. Thuc's family attempted to visit him but had to meet with him across from a glass divider with a phone. Supplies sent to him by the family, including copies of legal documents, tai chi exercises, and leisure reading, were denied to him by prison authorities. He has staged several hunger strikes while in prison. Thuc's immediate situation in prison had somewhat improved, but he continued to suffer from poor eye health, and potentially glaucoma, as his cell's electricity was cut off previously. However, recently, the prison allowed him to receive flashlights from his family, which they previously denied him. The authorities had also recently started sending Thuc's poetry and musical compositions created in prison to his family. After a recent family visit, Thuc's brother reported that Thuc is confident and has a positive attitude; in addition, his treatment in prison had slightly improved, and Thuc was even permitted to hug his family after their most recent visit. He also planned to continue pressing for an appeal of his conviction. In a letter home, Thuc reported that his eye sight was still not doing well, but it had improved over recent months. Throughout his imprisonment, Thuc has endured harsh treatment. He has often been targeted for standing up for the rights of other prisoners and has had communication with family limited by the authorities. In May of 2016, he was transferred to a prison farther away from his family. The reason for the transfer was unclear, but his distancing strategy has been used on other prisoners of conscience and could be related to his refusal to accept an early release in exchange for exile from Vietnam. Three UN Special Rapporteurs and the Vice Chair of the Working Group on Arbitrary Detention sent a letter to the Vietnamese authorities asking them to explain complaints against prison authorities that Tran Huynh Duy Thuc was being denied letters and visits from family, as well as being generally mistreated. They reminded the government of its legal obligations to uphold human rights and provide basic assurances to its prisoners. The letter came after authorities transferred Thuc to a prison farther away from his family, and after her underwent a hunger strike in protest of prison conditions. Amnesty International released an Urgent Action regarding his prison treatment. On the anniversary of his arrest, Amensty International released an open letter calling for Thuc's release. Thuc was one of the focus cases of the VOICE 2017 UPR campaign to hold Vietnam accountable to its human rights obligations. The 88 Project's Editor, Huong Nguyen, was interviewed by DiaCRITICS about The 88 Project and its history, as well as the state of human rights in Vietnam today and the case of political prisoner Tran Huynh Duy Thuc. British Member of European Parliament Julie Ward sent a letter to Vietnam's President calling on the country to release Thuc from prison -- and without the condition of exile.